#1) You have gone through the beginner’s series on Namaste Yoga (Namaste Yoga 129-135) and you know what to expect in the general flow of a Namaste Yoga class. In other words, you no longer need a preview of all the postures in the class at the beginning and you feel pretty confident that you are ready for the poses that will show up. #2) You have gone through the Beginner Yoga poses classes in Namaste Yoga from Namaste Yoga 153-159 so that you are familiar with the basic poses of yoga that will show up in many yoga classes. You feel self-reliant when it comes to mountain, tree pose, downward facing dog, bridge pose, triangle pose, the warrior poses, side angle pose, cobra pose, and bow pose. #4) You know how to look after your own body. You have been to see your medical doctor and you have received instructions based on your medical conditions and or injuries on what movements will help your medical conditions or injuries and what medical conditions will hurt your medical conditions or injuries. You know how to be your own best teacher in your yoga class. You know what poses work for your body and what ones you need to modify or leave out. #5) You`re starting to feel like I`m talking too much and giving too many instructions. You are ready for more silence in the yoga class. This is a sure sign that you are ready for the intermediate classes where you will be given less instructions, more space and time for reflection. #6) You came to yoga for the physical practice of stretching and strengthening your body but you notice you are receiving something more and you like it. Perhaps you notice you are less stressed, your emotions are a little more calm, you have more energy and are sleeping better and you have a little more connection with your spirit. 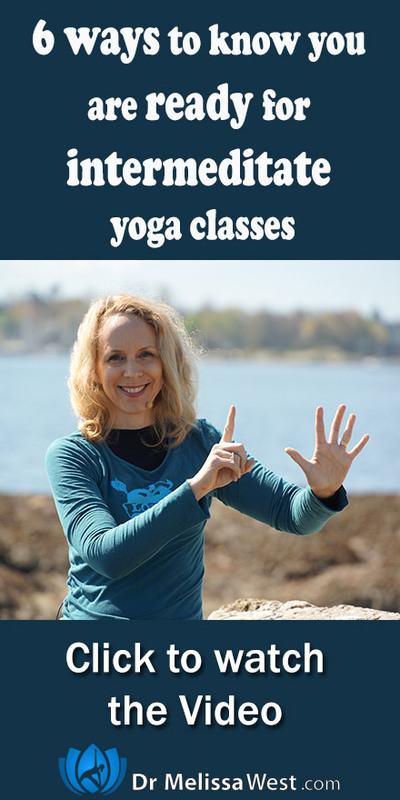 If you are interested in exploring this connection to your mind, emotions, energy and spirit then you are definitely ready to take the next step to explore some of the topics that I present in Namaste Yoga.